Gobi gosht is a good example of classic desi home cooking that works quietly while you are at home, and drops off when you move overseas. So, when I saw a photo of it pop up on my friend Mariam’s, currently living in Clinton, New York, Instagram feed, I immediately asked her how to make it. This is her mom, Bilquees's recipe. Mariam was gracious enough to 'digitize' the recipe from her mom's notes. Bilquees's own mother is originally from Bihar, India. 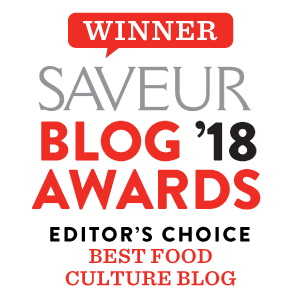 Although she was never able to visit her ancestral home after Partition in 1947, food was an important way of bringing, and keeping her family's heritage. Gobi is widely used in the sub-continent. So, I was surprised to learn that it's only been in cultivation in the region for the past 150 years. It was introduced by the British to the sub-continent in 1822 (according to a biology discussion forum anyway, they seem credible). Since then, it has become well, indigenized. The local South Asian variety of cauliflower/gobi is smaller than its European counterparts, and can grow in higher temperature and more humid conditions. Personally, I have always been suspicious of gobi. Unlike in the West, South Asians don’t roast it, or grind it to make faux rice like our clean-eating friends on Instagram. Instead, we fry or stew it in oil, with a rich blend of spices, which makes it look a lot less pretty. As a child, I would also find the texture irritating, and taste, underwhelming. I would audibly groan when anybody would serve something with gobi. 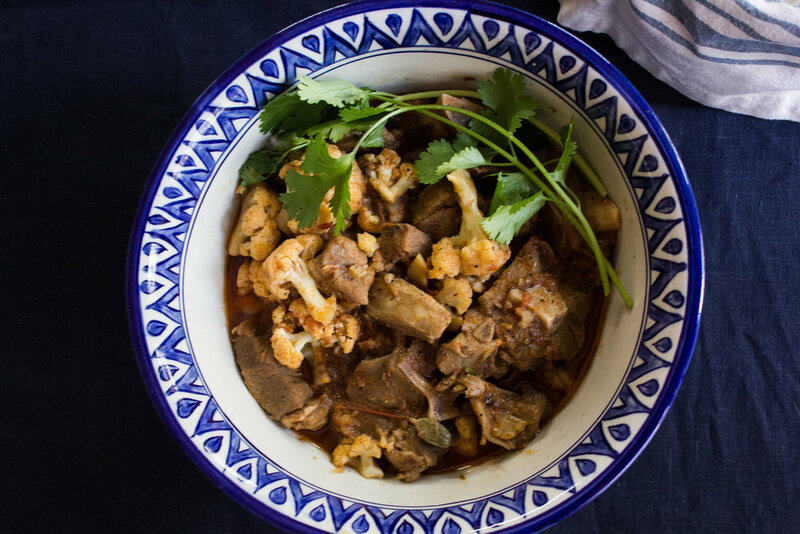 Bilquees’s gobi gosht however, brings cauliflower to life. The dish transported me back to my mother’s table in Pakistan. While my mom's choice of curry was aloo gosht (meat with potatoes), both dishes share a rich, heartwarming quality. 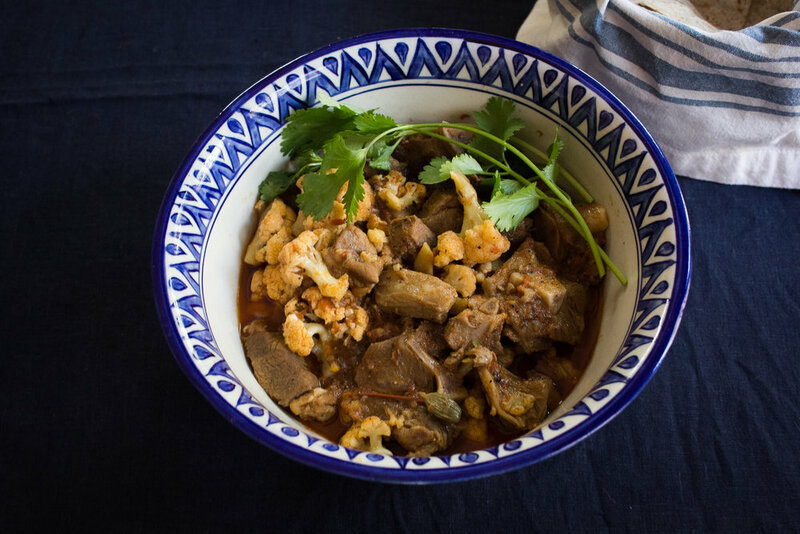 The spicy lamb gravy here infuses the cauliflower with incredible flavor, making this dish a pleasure to dive into. Gobi gosht is best enjoyed with roti/chapati, and a side of raita (savory yogurt). Enjoy. In a pressure cooker or stockpot, heat 1/2 cup oil. Add sliced onion. Sauté the onion on medium heat till it is medium brown/golden yellow, about 7 minutes. Add the meat, and fry till it is lightly browned, about 5 minutes. Add ginger and garlic paste, whole garam masala (cumin seeds, cloves, peppercorn, cardamom pods), salt, red chili pepper, chopped tomatoes. If using a pressure cooker, add 1 1/2 cup water. I used a stockpot, and added 2 1/2 cups. Bring the water to a boil, and cover. If using a pressure cooker, cook on medium heat roughly 10 minutes after the first whistle. I used a stockpot, and waited for the meat to tenderize on low-medium heat (roughly 1 1/2 - 2 hours). Once the meat is tender, remove from heat. In a large non-stick frying pan or wok, heat the remaining 1/4 cup oil, and add cauliflower florets, and salt and pepper to taste. Fry florets on high heat for roughly 5 - 7 minutes. Set aside. Turn your attention back to the meat. If using a pressure cooker, make sure it has cooled off, and open it carefully. Bring the heat up to medium-low, add the florets to the stockpot or pressure cooker, and fry the gobi gosht together for roughly 10 minutes. When ready to serve, garnish with cilantro and green chili, and dust with garam masala. Serve with chapati, and a side of cucumber raita.